This is one of the toughest stretches of the season for the Red Sox. They just wrapped up four games with the AL Central-leading Indians, and they face the Yankees in the Bronx this weekend. 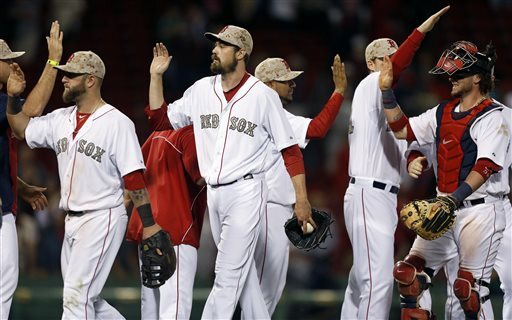 BOSTON – Tuesday night’s game against the Philadelphia Phillies is the final home game of May for the Red Sox. They’ll wrap up this strange little two-game series before packing their bags to begin a road trip against the Philadelphia Phillies. Boston and Philadelphia in a home-and-home series? Sounds like an NHL weekend circa 1972. Maybe they’ll ride in adjoining train cars down to Philly to continue the battle. This is one of the toughest stretches of the season for the Red Sox. They just wrapped up four games with the AL Central-leading Indians, and they face the Yankees in the Bronx this weekend. After that, they return home to face the AL West leaders, the Texas Rangers, before taking on the resurgent Los Angeles Angels. All of this comes on the heels of a month that featured just one scheduled off-day. Next Monday, the Sox will enjoy their second day off in a 34-day stretch. Playing that many games in such a short period of time has taken its toll on Boston. Over the weekend, the Sox placed both Shane Victorino and Will Middlebrooks on the DL. On Friday night, they had Jose Iglesias playing third base for the first time in his big-league career. The Sox reached Memorial Day just percentage points behind the Yankees in the race for first place in the AL East. It’s a solid start, far better than most people expected of this team. And it’s no longer a small sample. We’re nearly one-third of the way through the season. Memorial Day is one of the annual mileposts in a baseball season. The weather is getting warmer (allegedly) and the playoff races are taking shape. The division is as tight as we thought it would be, with four of the five teams within five games of first. You don’t make it through a baseball season without depth. So far, the Sox have gotten contributions from likely and unlikely sources. You have to feel good about a team when Mike Carp delivers a three-run homer on Friday night and follows it up with a key hit in Saturday’s comeback. Iglesias had three hits in Saturday’s win and drew a huge walk in the ninth inning during Sunday’s victory. The Sox scored four runs in the ninth to finish off the series against Cleveland with three straight wins. It was the biggest ninth inning comeback in six years, since the Mother’s Day Miracle against the Baltimore Orioles. That win in 2007 was the game that made us sit up and take notice of the Red Sox, who went on to win their second World Series championship in three years. Right now, you have to wonder if Sunday was a game we’ll look back at in October as one of the signs that this was something special. There’s still a long way to go. But with the sun and warmth returning to Fenway Park Monday, it was easy to daydream about long summer days ahead, and a baseball season that might stretch even longer than any of us had a right to expect after last season’s 93-loss debacle. Tom Caron is the studio host for Red Sox broadcasts on the New England Sports Network. His column appears in the Press Herald on Tuesdays.